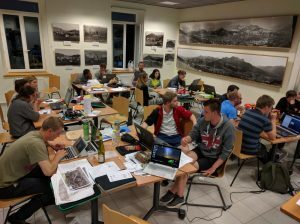 25 PhD young researchers were attending this course Among which two of our PhD students or long stay visitors (Maryam BenHammouda, UNIL and Ryan Kromer, Queens University). The exchanges were very fruitful and the course atmosphere was great. 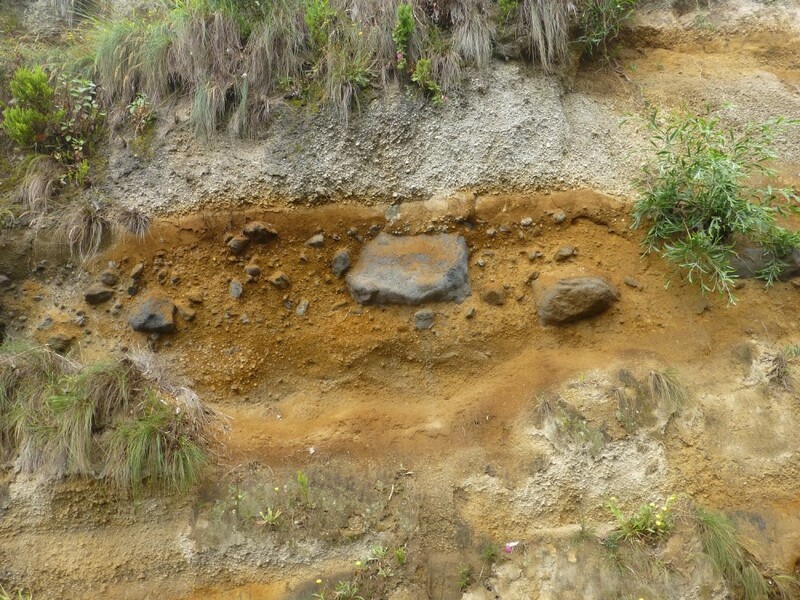 The visit of several landsides site were very interesting in such volcanic dynamic environment. Thank you to Rui MARQUES, Jean-Philippe MALET and José Luís ZÊZERE for the excellent organisation. On last 8th July Friday, two PhD students (Raja Mastouri and Zar Chi Aye) from the Risk Analysis group have successfully finished their public defenses and obtained their doctoral degrees in Geosciences. Congratulations! Raja Mastouri applied 3D seismic in combination with terrestrial laser-scanning and photogrammetry techiques to analyse faults and fractures in Eocene carbonate reservoirs, and to investigate basin tectonics in the Gulf of Gabes (Tunisia). Zar Chi Aye developed a prototype web-based collaborative decision support platform for risk management of natural hazards. This platform aims to assist risk managers in analyzing impacts of natural hazards as well as authorities and decision makers in the decision-making process for selection of risk management measures in a collaborative and interactive manner. If you are interested, check out the summary of their doctoral theses here and here, for more information. One of the main problems in risk management is the lack of good communication as well as efficient and effective collaboration between the agencies, services and organizations in charge of risk prevention, mitigation and management. The involvement of various stakeholder groups is an important component of risk prevention and mitigation. This calls for an integrated and coordinated approach which helps responsible stakeholders in managing risk, starting from risk identification to the decision-making process for achieving the best combination of risk reduction strategies. As natural hazards and associated risks are spatial in nature, web-based decision support tools integrated with Geographic information systems (GIS) have been increasingly considered as useful instruments for providing decision support. Taking the advantages of modern web, spatial and open-source technologies to achieve a centralized and integrated framework, in this research, a web-GIS based collaborative decision support platform is proposed for risk management with involvement of various stakeholders. The principal purposes of this research are: (1) to conduct a systematic and integrated risk management approach with diverse involvement of different stakeholders; (2) to explore the possibility and application of interactive web-GIS decision support tools for the analysis, communication and exchange of decision support information between risk management stakeholders and (3) to propose an innovative approach to potentially enhance collaboration activities between stakeholders through interactive and participatory approaches. The conceptual inputs of this study are based on the initial feedback, semi-structured interviews and observations obtained from the field visits and stakeholder meetings carried out in three case studies of Europe: the Małopolska Voivodeship of Poland, Buzău County of Romania and the Friuli-Venezia-Giulia region of Italy. Even though some platforms exist in study areas, no single case has a platform at hand which enables as flexible and collaborative approach for the formulation and selection of risk management measures as attempted in this study. Moreover, most platforms have focused mainly on inventory of events, risk visualization and dissemination of information. In this research, a prototype is realized and focused on the risk analysis, formulation and selection of potential measures through the use of an interactive web-GIS based interface integrated with a Multi-Criteria Evaluation (MCE) tool. This platform is regarded not only as a web platform for centralized sharing of risk information but also for ensuring an integrated framework where involved stakeholders can analyse risk and evaluate risk reduction measures. For the prototype development, a three-tier client-server architecture backed up by Boundless (OpenGeo) was applied with its client side development environment. This developed prototype was presented to the local and regional stakeholders of the study areas and feedback was collected to understand their perspective in determining whether the platform is useful and applicable for their activities in risk management. The prototype was also further evaluated with students to obtain feedback on different aspects of the platform as well as to analyse how the application of interactive tools could assist students in studying and understanding risk management. The main part of this research was carried out within the Marie Curie Research and Training Network “CHANGES: Changing Hydro-meteorological Risks as Analyzed by a New Generation of European Scientists” funded by European Commission’s 7th framework program (www.changes-itn.eu, 2011-2014, Grant No. 263953). The demonstration of the prototype application can be found on YouTube. You can also download the PhD manuscript here. 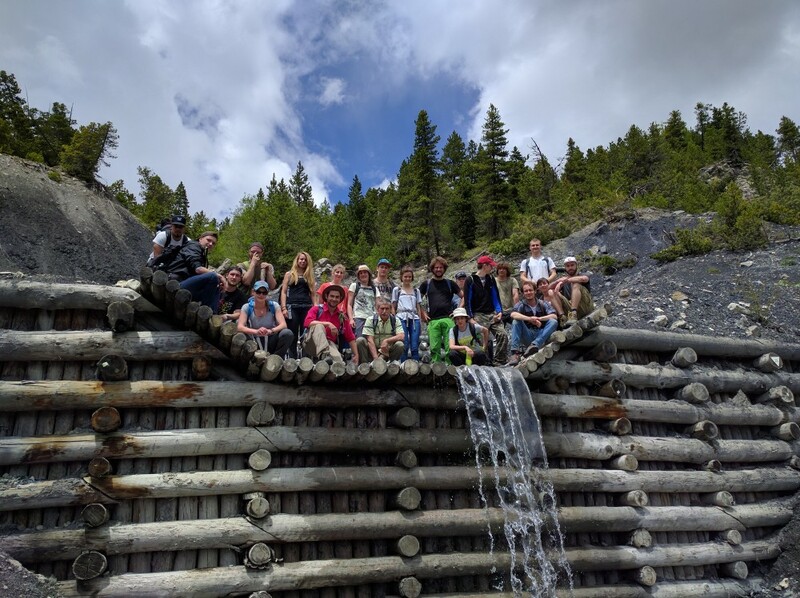 Beginning of June and for the third time, the field-camp for master students took place in the Ubaye Valley, in the area of Barcelonnette (France). 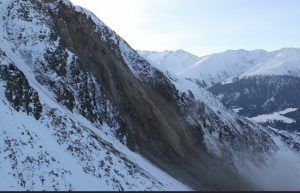 15 students had the opportunity to observe, map and analyze the landslide of La Valette and Super Sauze, the debris flows of Riou Bourdou, and the rockfalls of Le Cop. 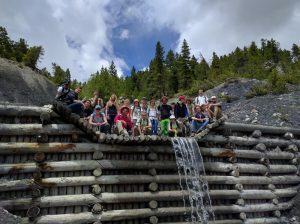 This 11 days field trip was made possible thanks to the facilities of the center Seolane at Barcelonnette. The Risk Analysis Group welcomes three new members. The group welcomes from April 25 to May 27, Melanie Mayers, a master student from Laval University in Québec. Her master project under the direction of Jacques Locat contributes to the Parachute research project. 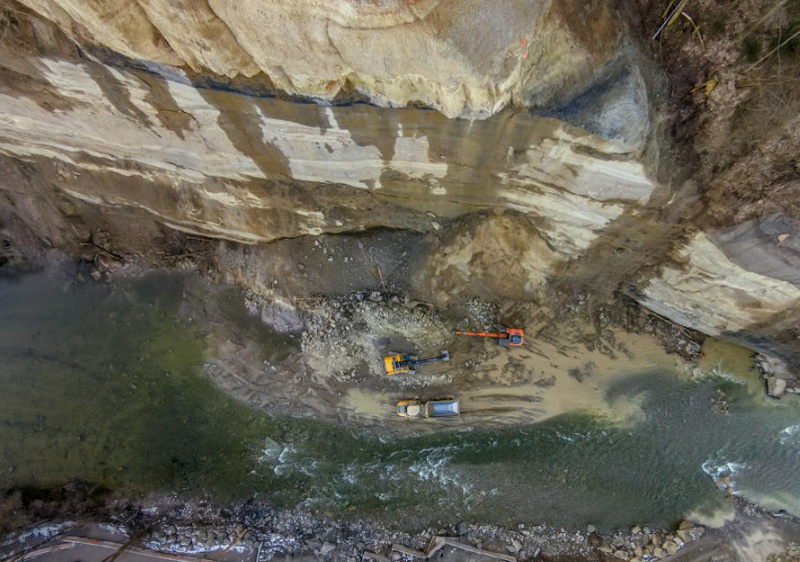 The aim of this project is to integrate various technologies into a workflow for rockfall characterization along linear infrastructures, using a 260 km-long railroad as the study site which is located on Québec’s North Shore, Canada. Caroline Lefeuvre a master student from the École nationale supérieure des mines d’Alès (EMA, France) is visiting the group from April 11 until September 9 . She will investigate various influences such as thermal incidences over rock slope stability at the study site of La Cornalle (Vaud). Hazards related to rockfall events will also be addressed. Emmanuel Wyser is starting his Ph.D under the supervision of Prof. Michel Jaboyedoff. His research is oriented toward the study of granular flows and particle-based methods, with numerical and analogue models. 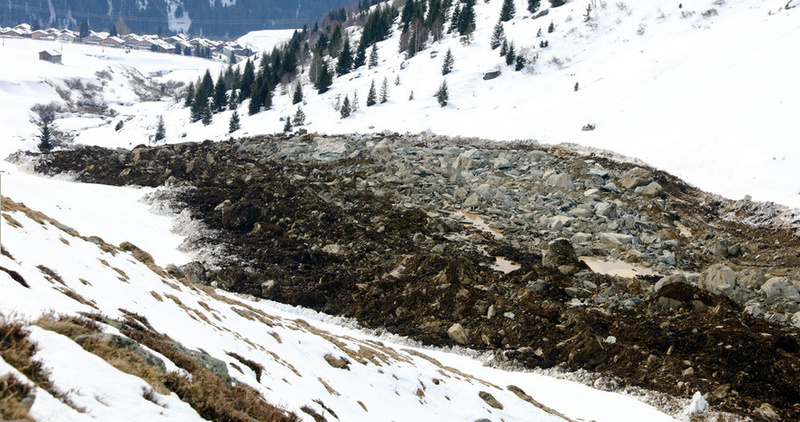 Rockslide on snow in Val Sterm (GR), Switzerland, on 15 March 2016. At 6 PM on 15 March 2016, a 200’000 m3 rockslide occurred in the unoccupied valley Val Sterm near the village of Sedrun (GR) on 15 March 2016. 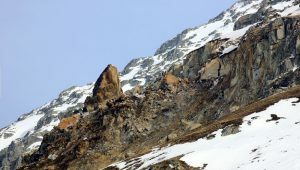 Rocks fell from the East side of the North -South oriented valley and, after reaching the valley bottom, turned 90 degrees southwards and came down the snow covered valley on a runout travel distance estimated to about 1 km. Nobody were injured by the event but a water supply infrastructure was damaged. 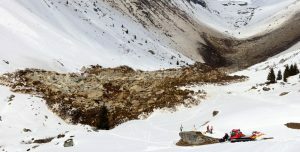 Source: RTR, Südotschweiz, NZZ and Tages Anzeiger. River damming by rockfall in Wohlusen (LU), Switzerland, on 11 January 2016. 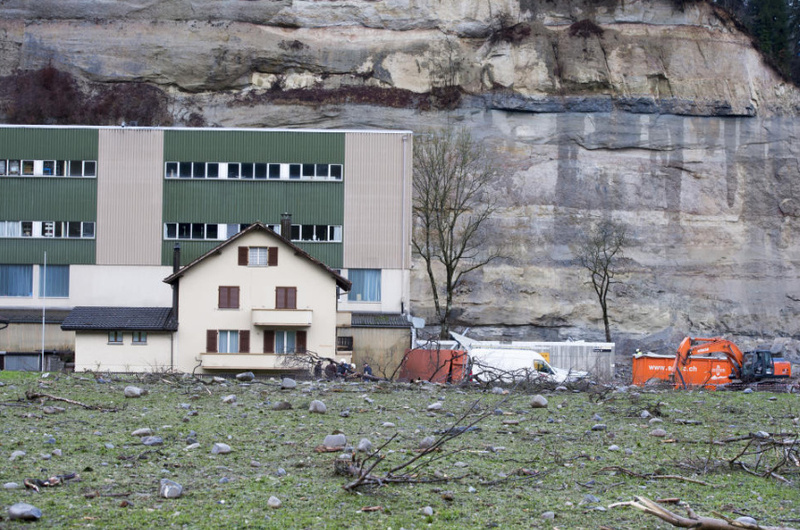 At 3 AM on 11 January 2016, a 5’000 cubic meters rockfall fell from a 50 m height cliff in the village of Wolhusen in the Canton of Luzern, Switzerland. The rockfall fell into the Kleine Emme river, built a dam deflecting the river path. The cliff was described as highly hazardous in the hazard map. 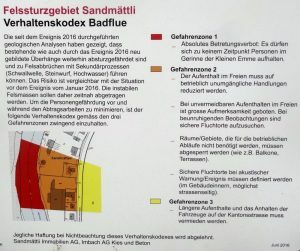 The neighborhood composed of residential and industrial buildings was flooded (with diesel pollution) and boulders were projected over a travel distance of 200-300 m causing damages to buildings. 20 people have to be evacuated, a main road as well as a train track had to be closed and 3 power supply installations were affected generating power failures. Nobody were injured by the event. 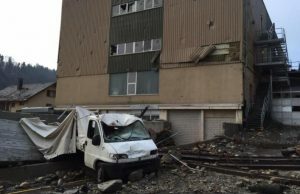 Damage are estimated to over 1 million Swiss francs. 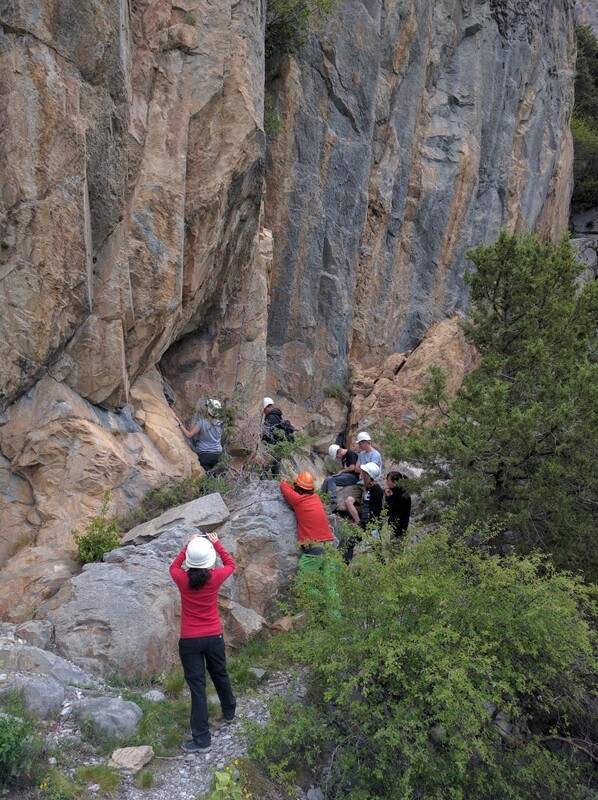 After the event, the cliff has been cleaned and secured. On the ground, 12’000 cubic meter of deposit material have been evacuated. Repair work including flood protection wall restoration last until early summer 2016. 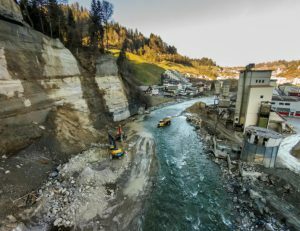 Further similar rockfalls in the same site are expected and therefore the Canton of Luzern has started a global risk reduction project in this area for rockfall hazard and floods. UAV video here (ZSO Emme). Sources: Neue Luzerner Zeitung (1), (2), (3) and (4); Neue Zürcher Zeitung (1), (2), (3) and (4). Twelve persons of the Risk Group participated to the European Geosciences Union (EGU) General Assembly in Vienna, Austria, on 17 April to 22 May 2016. 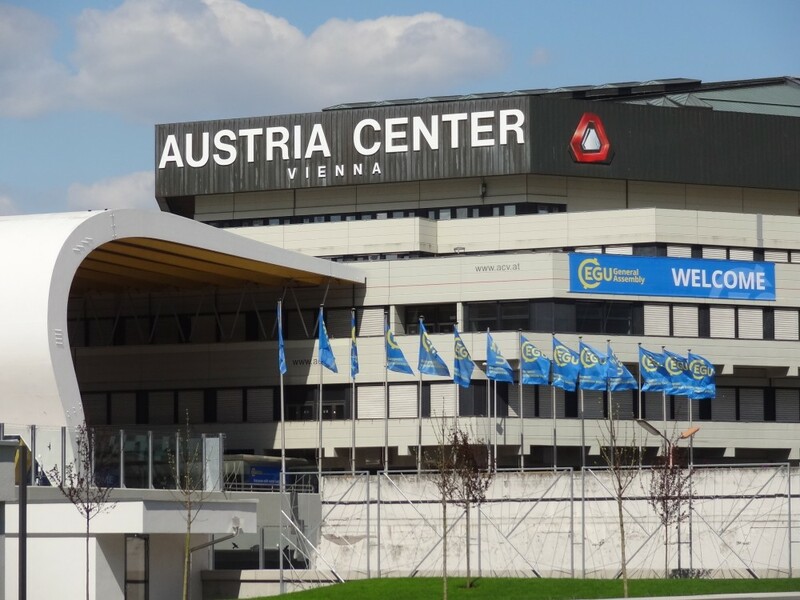 This huge meeting brought together 13’650 scientists from 109 countries with 4’863 orals, 10’320 posters and 947 PICO presentations. It is always an excellent opportunity for our group to meet new people and other scientists we work with during the five days of the meeting. The Risk Group people presented 30 contributions as first authors whose titles are below. A Multi-Scale Approach for fracture characterization. Maxime Collombin et al. Automatic and global optimization of the Analogue Method for statistical downscaling of precipitation – Which parameters can be determined by Genetic Algorithms? Pascal Horton et al. 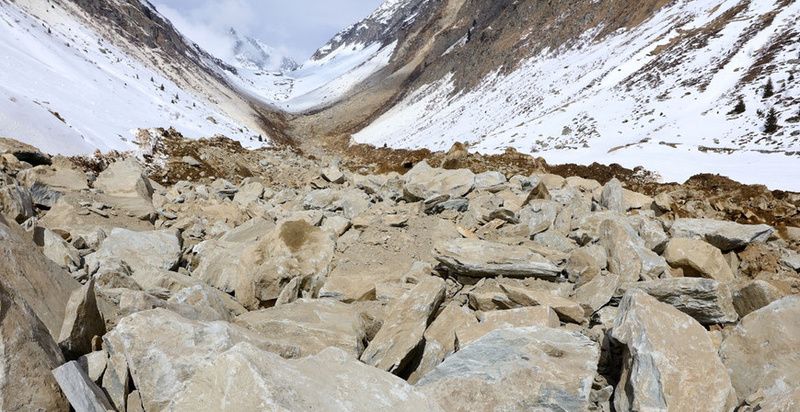 Rapid Offline-Online Post-Disaster Landslide Mapping Tool: A case study from Nepal. Roya Olyazadeh et al. An Offline-Online Android Application for Hazard Event Mapping Using WebGIS Open Source Technologies. Roya Olyazadeh et al. 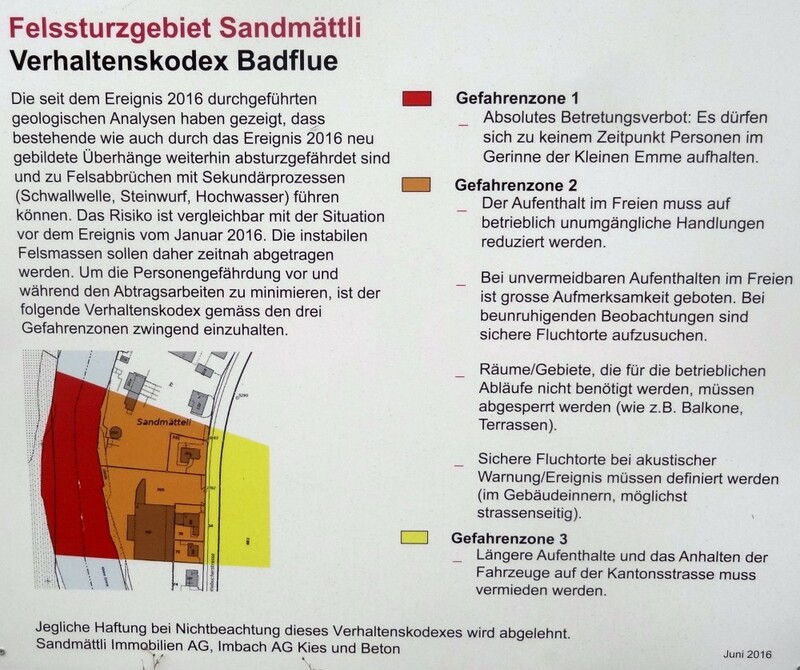 Impacts of the May 2015 bad weather in Western Switzerland. Jérémie Voumard et al. A prototype web-GIS application for risk analysis of natural hazards in Switzerland. Zar Chi Aye et al. Stability of Molasse: TLS for structural analysis in the valley of Gotteron-Fribourg, Switzerland. Mariam Ben Hammouda et al. 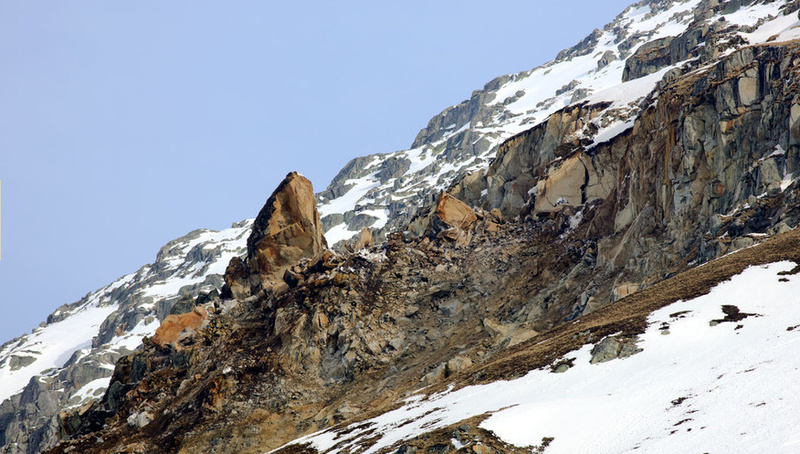 Specific analysis of the recent rockfall activity in the southeast face of the Piz Lischana (Engadin Valley, Graubünden, Switzerland). Susanna Büsing et al. 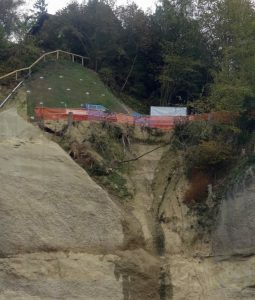 Combining SLBL routine with landslide-generated tsunami model for a quick hazard assessment tool. Martin Franz et al. 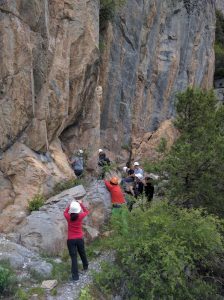 Intraday monitoring of granitic exfoliation sheets with LiDAR and thermal imaging (Yosemite Valley, California, USA). Antoine Guerin et al. Testing failure surface prediction methods and deposit reconstruction for the landslides cluster occurring during Talas Typhoon (Japan). Michel Jaboyedoff et al. Simulation of the transfer of hydrocarbons in unconfined aquifer in tropical zone: the case of benzene. Amenan Agnès Kouamé et al. Analogue and numerical models coupled with structural analysis to investigate the runout of dry granular flows. Céline Longchamps et al. 4 years of high-resolution LiDAR erosion monitoring of an elementary gully in the badlands of SE France (Draix). 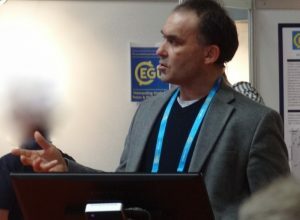 Benjamin Rudaz et al. 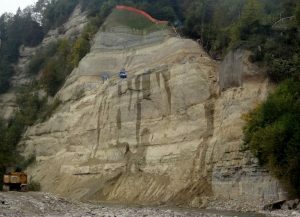 Characterization and monitoring of the Séchilienne rock slope using 3D imaging methods (Isère, France). Cindy Vulliez et al. Regional transportation network blocked by snowdrifts: assessment of risk reduction strategies by the example of the wind event of February 2015 in the Canton of Vaud, Switzerland. Jérémie Voumard et al. 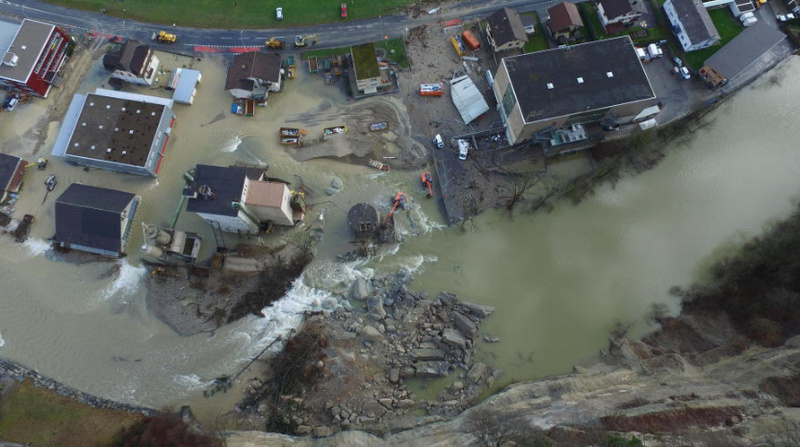 Analysis with SfM on-motion method of July 2015 extreme rainfall impacts on the S-charl valley road in the Canton of Graubünden, Switzerland. Jérémie Voumard et al.